The AFL NSW/ACT Youth Girls capped off an impressive weekend yesterday, winning their second match against Tasmania at the 2018 NAB AFL Women’s Under-18s Championships in Blacktown. After a year’s worth of training and development under the watchful eye of their coach, GWS GIANTS AFL Women’s player, Alicia Eva, the Rams lifted to take the game to the Tasmanians. 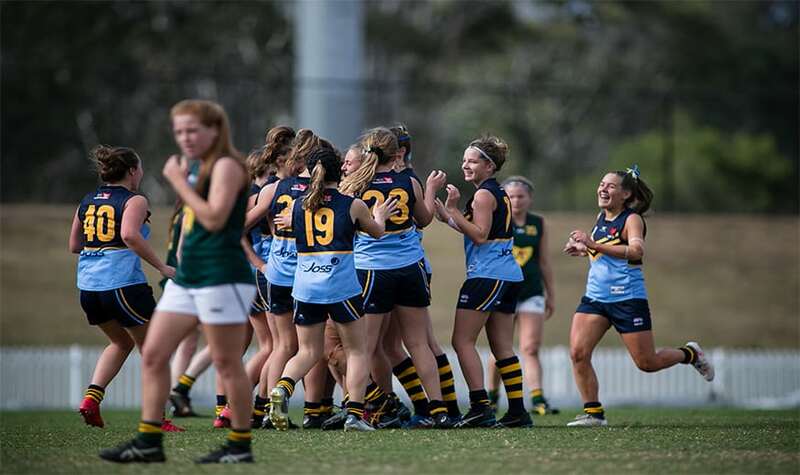 Eva, who will also coach the Eastern Allies – a hybrid New South Wales, ACT and Tasmanian side – in the next round of the 2018 NAB AFL Women’s Under-18s Championships, said she was very proud of the group’s effort. “It was a pretty hotly contested game, particularly in the first half, goals were really hard to come by,” said Eva. Grafton’s Lillian Doyle was a star in front of the goals across the weekend, slotting four goals for the Rams over the two games, while Albury’s Brea Quinlivan kicked three. Through the middle, Thurgoona’s Alyce Parker starred again, taking home the Most Valuable Player Award for the AFL NSW/ACT team as voted for by the umpires for the second year running. While only one player could win the award, Eva says there were a few who put their hand up across the final match of the weekend. “Alyce Parker stood out. Her work rate around the ball was impressive across the whole game. “Georgia Garnett out on the wing, opened up the fat-side of the ground for us really nicely, particularly in the third quarter. “Ange Prifitis showed a bit early, which was good to see when playing a different role . The Eastern Allies squad will be announced soon with the final team set to come up against the Central Allies (a hybrid SA and NT team), Western Australia and Queensland on the Gold Coast in July.